Wouldn't you want the smartest technology in your home to be the alarm system that's protecting you, your family and belongings? Absolutely. As a bonus, our alarm systems can act as the controller or "hub" that we can add more smart home devices to. Have you already started building your smart home? Our systems can integrate with a lot of the top devices on the market today like; Nest, Amazon Alexa and Google Home. See "Smart Home Integration" below. Probably one of the most sought after smart home devices are thermostats. Giving you the ability to remotely control your heating system via your computer or smartphone can be very helpful, especially for people with property that is unoccupied for long periods of time. They can also save you money on your heating bills! Set up heating schedules and have them automatically lower the temperature when you arm the alarm system and leave the house. Remotely lock and unlock your doors. Assign a different code to each user. Receive notifications when the door is locked or unlocked and know which user did it. Choose to have the lock automatically re-lock itself. Illuminated keypad for easy code entry in the dark. Have the lights automatically turn on when you arrive home and disarm the security system. Have you already started building your smart home? Our systems can integrate with a lot of the top devices on the market today like; Nest, Amazon Alexa and Google Home. Already have a Nest thermostat? Our systems powered by Alarm.com's Interactive Service can integrate with your existing Nest thermostat. By linking your Nest account with Alarm.com, you'll be able to view and control the thermostat settings via the Alarm.com mobile app or website. Use your voice to control your alarm system and smart home! 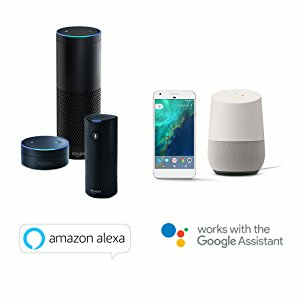 Enable your Alarm.com account to link with Amazon Alexa or Google Home. Want a light on? Just ask! Click here for more info. Alarm.com and SONOS have announced they will be able to integrate their award winning technologies in 2018. Nothing has been confirmed yet as far as features. We at Home Security Service have taken and passed the SONOS Academy Course and are authorized to purchase and sell SONOS products.